After yesterday’s draw of crude inventories, crude prices are higher this morning at $50.14 gaining 58 cents (1.7%).Prices saw sizable gains during yesterday’s trading session following the EIA inventory report, rising $.82 (1.7%). The bullish market following the EIA report has continued to give optimism for producers (and pessimism for consumers) that inventories will continue to be drained. Refined products are both higher this morning. Diesel fuel is at $1.6732, almost 2 cents higher than yesterday’s closing prices. Gasoline is $1.6445, nearly 2 and a half cent above yesterday’s close. Yesterday the EIA released their weekly oil inventory data. 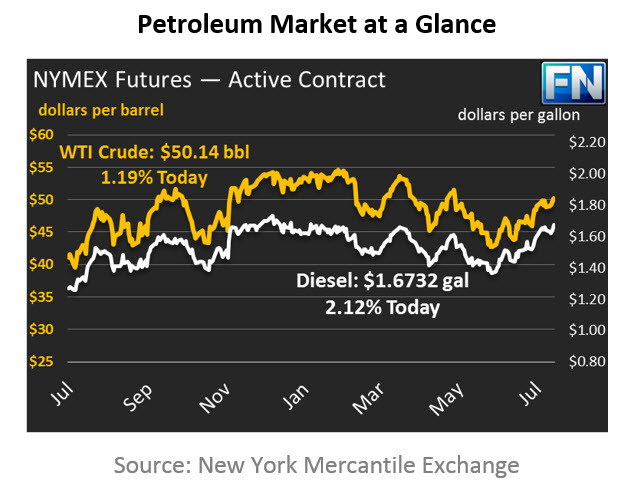 The report was bullish showing a continued draw of crude and diesel inventories. When the market is bullish, less product is being produced or imported while demand remains at the same or higher level, driving up the price of oil. Crude drew for the sixth consecutive week, which is attributed to lower imports and an increase in refinery runs. Refinery utilization increased this week by .90ppt to 96.3%. Gasoline had a surprise build of 3.4 MMbbls, 1.9MMbbls over expectations, the first build in 8 weeks. This build is counter-seasonal as stocks are now 12MMbbls above the 5-year average. The EIA reported larger than expected diesel draws of -1.7MMbbls, bringing diesel stocks down to 2015 levels for the first time this year.